GUTHRIE, Okla. – K.C. Jones has spent half his life coming to the Lazy E Arena every March to compete in the Timed Event Championship of the World. Jones, 46, is in this exclusive field for the 23rd time in the event’s 30-year history. He’s one of two men who have earned the coveted championship five times. On Friday afternoon, he scrambled through the opening round of five runs in 56.7 seconds to take the early lead. 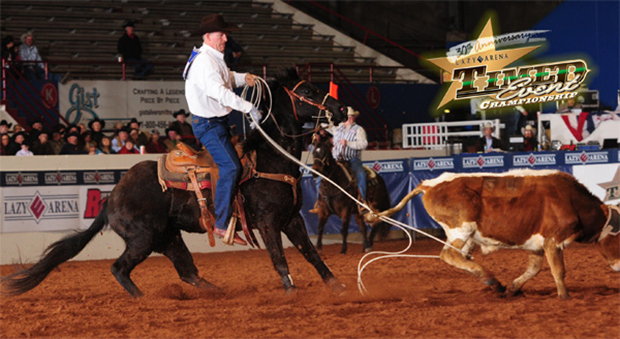 Jones is one of four former champions competing at the Lazy E this weekend; only 2010 winner Josh Peek is not among the top three. Jones is trailed by two-time titlist Kyle Lockett, who roped, tied and wrestled five head in 57.2 seconds, and three-time and reigning champ Daniel Green, who posted a 61.1-second round. Jones did. In fact, he was steady throughout each of the five runs – after 23 years and five gold buckles, he understands the name of the game is staying away from mistakes. But this is the most grueling test in rodeo, and sometimes these top-level cowboys let their competitiveness get in the way. That was the case with Timed Event rookie Cody Doescher of Oklahoma City, who was solid through the first four runs, posting a 40.3-second cumulative time. His final run of the round in steer roping became a little menacing; he had to trip his steer twice before he could secure the tie. Doescher is ninth in the standings, but he’s learning rather quickly what a true challenge the Timed Event is. 1. K.C. Jones, 56.7 seconds; 2. Kyle Lockett, 57.2; 3. Daniel Green, 61.1; 4. (tie) Landon McClaugherty and JoJo LeMond, 65.4; 6. Dustin Bird, 66.4.